Townsville Town Common Conservation Park and Cape Pallarenda Conservation Park borders the ocean and is full of places to go and things to do for those who love a breakaway from it all. From Rowes Bay through to the tip of Cape Pallarenda, this area has it all; Recreational trails spanning mountain tops, sandy beaches and coastal wetlands. Visit this area and absorb some amazing views and enjoy nature-based recreation close to Townsville city centre. Mountain bike riding, rock climbing, bushwalking, bird watching, wildlife viewing and plant IDing are a few of the activities on offer here, along with discovering secret beaches and venturing deep into mystical forests without worrying about losing your way. Townsville Town Common Conservation Park is 6 km north of the Townsville city centre. Vehicle access to the bird watching areas is via the main entrance on the turn-off from Cape Pallarenda Road. The gate at this entrance is open from 6.30 am to 6.30 pm daily. The best time of the year to visit Town Common are between April and June, after the wet season when wildlife and birds are abundant including wallabies, magpie geese, brolgas and quite a few birds of prey. Both cycling through the park and hiking are popular activities, however, you must take plenty of drinking water, where sun protection (i.e. a hat & long sleeve shirts) and appropriate footwear; Remember to take the insect repellent as you may encounter a few mossies, especially at sundown. There are various treks about the park. Some are short, while a few are long and can be strenuous for some. The walks can be a few hours long and general fitness should be a consideration. Since the area is fairly open, there is a nice breeze to keep temperatures very comfortable most of the year. the ridge tops. The Lagoon and Freshwater skirts the wetlands, passing Tegoora Rock (also known as Croc Rock) on its way north. The wetlands are seasonal, the roads may be closed during the summer rainy season, and parts of the track may underwater, or overgrown, lost in heavy grass growth. Even if you're not into long walks, there's something for everyone; fishing, boating, BBQs, playgrounds, WW2 history and even an unofficial naturalist beach, it can all be experienced. There's plenty of interesting shells are washed up along here, which is fun for beach combing. We prefer the time of day when the tides are low, for exploring. Both Lagoon Trail and Freshwater Trail are park maintenance roads and run alongside the wetlands. The are very easy going and both walkers and mountain bike riders share these trails. Starting at the intersection of Freshwater and Shelly Beach trails or opposite Walter Nesbit Park at the end of Cape Pallarenda Road, this trail follows the edge of Freshwater Lagoon at the southern base of Many Peaks Range. The trail can become boggy after wet weather. Starting at the intersection with Shelly Beach and Lagoon trails, or 1.2 km along the eastern end of the Lagoon trail, Freshwater passes through coastal sand dune vegetation, crosses the dam wall of Freshwater Lagoon and provides access to the Freshwater and Jacana bird hides. The walk has spectacular views over the Town Common wetlands and along the coastline. Many Peaks Track has several lookouts overlooking the airport, Town Common wetlands, Tegoora Rock, Castle Hill, Palm Island Group, Magnetic Island, and surrounding beaches. The trail takes you up to the summit of Mt Marlow (213 metres) and descending through vine thickets and woodland towards the wetlands and into the old Bald Rock car park. There is a bit of shade along the way which is great in this climate! You will also pass by Bald Rock and Tegoora Rock. Tegoora is Coonambella (Townsville) language for "thunder'. Starting at Bald Rock on the western end, or 450 m along the eastern end of the Lagoon trail. In some areas the trail can be indistinct and walkers must follow the orange trail markers. I suggest you walk from Pallarenda Park and then you can choose to return via the Lagoon trail which is the easiest, the Freshwater trail is a little longer but still easy walking on level ground, or the Under the Radar trail which is the longest and most interesting; you'll just need to give way to mountain bikers. This short walk will take you past World War II forts and gun emplacements and down into the unofficial naturalist beach. These WW2 structures are worth the walk to see and provide a good place to sit, relax and take in the view. There is also a short loop track here that takes you past the old weir and graveyard. See the Cape Pallarenda Conservation Park map. Shelly Beach is access via Shelly Beach Trail or via continuing on past Shelly Cove at low tide. Following the edge of a large marine plain, the Shelly Beach Trail leads through coastal woodland before finishing at the western end of Shelly Beach. The northern part of this trail, towards the beach, is soft and sandy, and can be physically demanding. 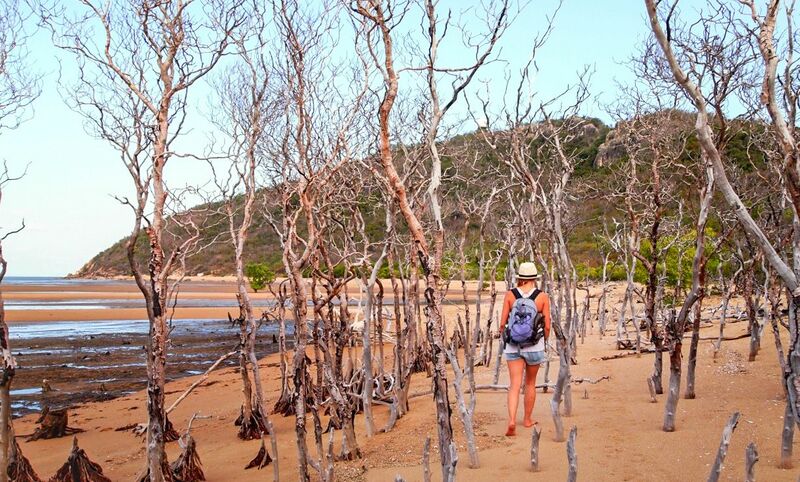 This walk is 450 m one way and takes you to a bird hide the overlooks Freshwater Lagoon. It's a good place to spot nesting and foraging waterbirds. This walk is 850 m return and meanders through melaleuca forest within a seasonal wetland. This walk is 1.7 km return and follows the edge of Barramundi Waterhole and is shaded by melaleucas, eucalypts and acacias. In the cooler parts of the day this is a good area for viewing forest birds such as honeyeaters and kingfishers. This narrow, two-way trail is designed for cross country mountain biking. Walkers must be alert and considerate for mountain bike riders approaching from either direction. It provides excellent views of the islands to the north and the Coral Sea beyond and crosses the northern and western slopes of Many Peak Range. UTR (Under the Radar) is fairly easy but has rough surfaces and some steep sections. The trail begins 700m along the Shelly Cove trail at the eastern end and at the western end, UTR begins 500m along the Shelly Beach trail in Townsville Town Common Regional Park. There is also a link trail that leads to Smedley's trail (see map). Accessed via a link from UTR (6.6 km from the eastern beginning of UTR) or 2.8 km from the beginning of Shelly Beach trail. This circuit winds around Smedley's hill taking in panoramic views over the Town Common wetlands, Bohle River and the Coral Sea to the north. It is a challenging but rewarding ride with steep sections, rock obstacles, rock armoured corners and optional B lines that are rated as difficult. Cape Pallarenda is a Marine Park Zone A, so you will have to check on limits with fishing. At the time of writing, the limit was one line per fisherman, and certain bag limits on crabs and oysters etc. Remember that domestic animals are not allowed in this park. Please note that camping is not permitted in Cape Pallarenda Conservation Park.